Match number 55 saw Puneri Paltan take on the Kolkata-based franchise Bengal Warriors in the ongoing Star Sports Pro Kabaddi season 3 at the NSCI SVP Stadium, Mumbai. Deepak Niwas Hudda steered Pune’s ship with 13 points to his name and help them finish the league stage on 3rd spot and a place in the semi-finals for the first time in their history. It was Puneri Paltan who drew first blood with two quick defensive points by getting Mahendra Rajput and Mahesh Gaud out in their first raids of the match. Deepak Niwas Hudda increased Pune’s lead to 3-0 following a successful raid in the early minutes at the NSCI SVP Stadium. Korean import Jang Kun Lee and Mahendra Rajput opened the scoring for the Warriors, however, it was Pune’s Tushar Patil who scored the first super raid of the match by scoring 3 touch points and helping the Paltans take a 4 point lead with 6 minutes played in the first half. In the next few minutes, Mahendra Rajput scored some points to make it a 1 point game by the end of 9 minutes in the first half. However, The spirited Pune side took the game away from the Warriors with Deepak Niwas Hudda securing touch points in almost every raid against the slow Bengal defence. With the help of Surjeet and Deepak Niwas Hudda’s heroics in the first half, the Pune-based franchise opened up a 12-point gap between them and their opponents. The second half saw both the defensive structures working as a well-oiled unit with no raid points scored in the first 5 minutes. 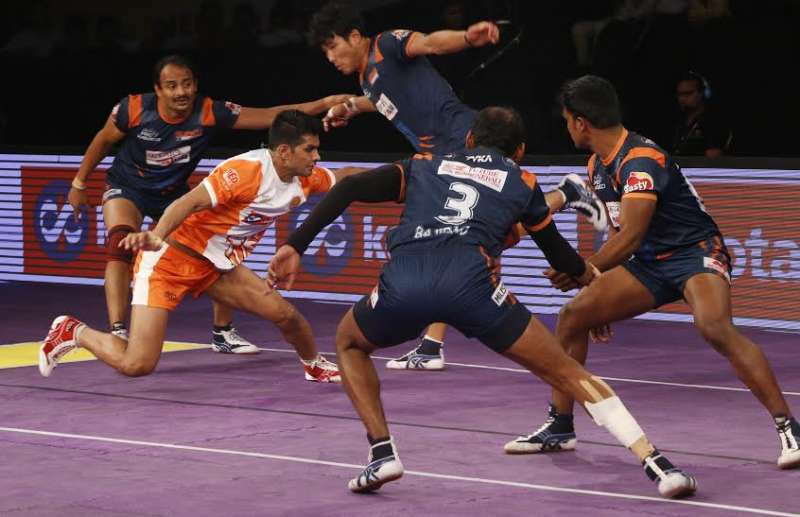 However, it was just a matter of time for the Pune-based franchise to increase the gap between them and their opponents, Nilesh Salunke scored 4 touch points in a single raid to break Bengal’s any hopes of making a come back into this game. A minute later, Deepak Niwas Hudda completed the second all-out on the Warriors to increase their lead to 18 points with just 10 minutes left to play. Vineet Sharma and Mahendra Rajput tried to steer the sinking Warriors’ ship but were unable to decrease the deficit with little time on their side. It was Deepak Niwas Hudda’s day as he inflicted 3rd all-out of the night on the Warriors with just a couple of minutes left on the clock. With this win, Puneri Paltan enter the semis for the first time in their history and finish the league stage at the third place, 1 point ahead of Bengal Warriors who also qualified for the semis for the first time in their history.